that was released on 4th November 2016. 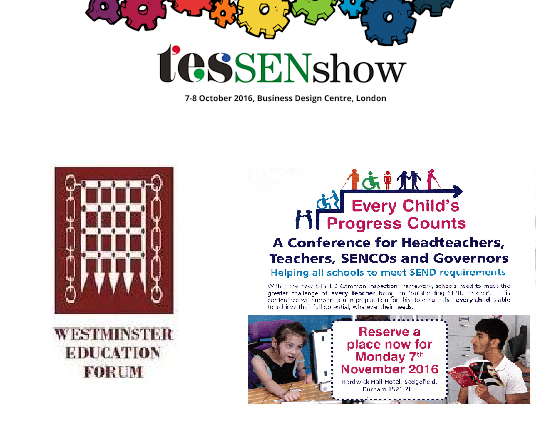 In my last SEN update, one of the forthcoming SEN events that I discussed was the Westminster Education Forum being held on 3 November 2016 (yesterday), entitled ‘Policy priorities for SEND - implementing local area inspections, raising educational outcomes and extending support for families’. So, as I attended myself, I am able to report to you on a few things now ‘hot off the press’. The keynote speech was given by Dr Adam Boddison, the new Chief Executive of nasen, who previously was director of the Centre for Professional Education at Warwick University. His talk was entitled: ‘The outlook for children and young adults with SEND - remaining challenges and next steps going forward’. Amongst other things, he said that data from July 2016 obtained by SchoolsWeek (again) found that only 18.2% of Statements of SEN had been transferred to EHCPs by then, so they had calculated that, on this figure if projected forward, it will theoretically take a further 5 ½ years more to complete these transfers, so it could still be going on until March 2020! (He did also point out that the DfE says that people are getting better by now, so things will get quicker and LAs should still meet their target, in theory, but he also said that there were huge variations between different areas). I was particularly impressed by two other speakers as well. First there was Janet Thompson, the Deputy Chair of the Rochford Review and Headteacher of the Dorothy Goodman School in Leicestershire. She was clearly very knowledgeable about SEN issues and responded to criticisms of the report), such as that it would allow for lower aspirations (which she said was wrong, but the key was to focus on 'stage' not 'age'); that it was disruptive (which she said was missing a trick, as it was important to input when the whole assessment system was changing as well for subject-specific learners); and that data was not going to be reported widely enough (where she said that P-scales were not a curriculum, but had become that way and it was not just about ticking boxes and we needed to look at thing leading to supported living, obtaining employment, etc. The second was Anne Heavey, an Education Policy Advisor at ATL, who spoke about ‘Assessing SEND provision for pupils in mainstream schools - current state of play’. ​She gave us a number of statistics from surveys, which seemed to show that 72% of people feel that things are not yet working and 56% of pupils with mental health problems are not having their needs met. She ended by saying we need more time, more money and more training. Kidz to Adults North exhibition (a free event) being held at Event City in Manchester on 17 November 2016. I am sorry that all these events seem to be being held quite soon, but there aren’t many things being held in December 2016 (probably because of Christmas! ).